Have you ever thought that the best solution to your cat problems could be summed up in two words, “cat-proofing fence?” While it is hard to visualize your cat in some kind of physical enclosure, the options for cat fences are many, and the best one probably never crossed your mind! Felines are curious and love exploring their outdoor environment as much as their canine counterparts. Even a devout “indoor cat” will occasionally ask to go outside in order to sunbathe, roll in the grass, nibble some greenery, hunt garden insects, and frolic the day away. The solution is right before your eyes- Pet Stop®! Another option for your feline, that has exploded in popularity in the last twenty years, is the invisible fence. And the great thing about a cat fence is that you can use it both indoors and outside! This technology isn’t just better than the typical cat fence rollers that many people utilize nowadays. Using just three things: a boundary wire, a collar/receiver, and a transmitter, Pet Stop® has revolutionized the entire pet fence world with its unprecedented technology, durability, and made-in-the-USA highest quality and standards. Offering three different setups for you, the EcoLite, the UltraElite, and the Consumer Digest Best Buy-award-winning PC-200, you are certain to find just the right fence to keep your kitten safe and happy. GentleSteps™- the easy and gentle way to train your furry feline. Both Pet Stop®’s EcoLite and UltraElite systems feature the effective training system GentleSteps™, used immediately after installation to get your grown kitten used to the new limits. A very, very, light tickle of a sensation is used as the cats approach the new fence perimeter. It lasts barely a millisecond and gently lets your pet know where they are free to roam, and where they need to stay. It has been lauded by owners and pet professionals since its introduction and will put you on the fast track to a secure, content cat companion. The three systems’ collar receivers all feature TriScann, Flash Alert®, and Safety Stop®, designed to alert you immediately of any problems with functionality. TriScann is a triple antenna receiver, keeping your cat in range at all times. Flash Alert® notifies you immediately of a low battery charge, and Safety Stop® will cease correction if your pet is somehow stuck in a range of the signal field. The transmitters all feature Power Loss Memory (PLM,) Wire Break Indicator, Lightning Protection, and Zapp Alert, among other bonuses, to help you know immediately if anything affects the transmitter’s operational capacity or the boundary wires. You can throw away all your deterrent sprays when you take advantage of the Room Wizard™ indoor transmitter, compatible with the outdoor transmitter. This amazing indoor device is available in wired- or battery-operated versions. It is stylish and discreet in design, able to be placed under or behind furniture. If you select the wired transmitter, the wires can be completely concealed in your home. Using the gentle and effective Smart Zone™ technology, your pet will receive a barely audible sound to alert her of her boundaries, and a small correction if needed. Room Wizard™ will help you easily customize your home to keep your cat out of harm’s way and give you peace of mind! Let’s face it, there are only a couple ways that are really going to solve your problem. Many people resort to using DIY cat fence solutions but when that’s no longer working, what do you do then? Let’s take a look at a few of the pros and cons of traditional fences out there used to control our feline companions. It is a wonderful time to be a proud cat owner. New cat fence options are reaching the market every day, for all types of households, budgets, and cat temperaments. Listed below are the four most widely-available cat fences: what they are, how they work, and how effective they are. As you can see from the diagram, this tech works by simply rolling as your feline friend reaches the top of the barricade. In doing so, the roller rotates and prevents paws from gripping. These types of rollers will also prevent unwanted cats from reaching inside your premises as well. Naturally, cats want to stray. It’s in their nature to explore the outdoors & observe their surroundings on a daily basis. Unfortunately, with these systems, there’s lack of capability depending on what type of perimeter you have set in your background or front yard. An underground fence or wireless fence would prove to a more effective system as it allows you to have the desired fence you’d like without compromising the aesthetics. Not a fan of the high-tech escape-proofing? Check out a time-tested solution: cat fence rollers. Cat fence rollers are a harmless way to keep your cat within the confines of your backyard. Where can I place cat fence rollers? Cat rollers are placed atop your existing fence, in order to prevent your cat from escaping your yard. Cat rollers are simply wooden or metal bars or rails that roll, so cats are unable to get the proper footing to escape. How do cat fence rollers work? Placed at the highest level on your gate or fence, cat fence rollers are an effective, very humane way to keep your cat safe in her yard. The agilest feline will never escape the slippery rails of a roller. Are cat fence rollers effective? Cat fence rollers are still in wide use today, throughout the world. Aesthetically, they blend in with the look of a home and are unobtrusive. They are easy to maintain and are ideal for cat owners who prefer a traditional approach to cat containment. Why a wireless cat fence? A wireless cat fence is the most discreet way to establish boundaries in and outside of your (cat’s)home. It is also one of the easiest barrier systems to set up, and they are available in all price points, sizes and programmable options. Where can I place a wireless cat fence? Wireless cat fences can be used outside, in your back or front yard, or inside, keeping your cat safely out of innocent mischief, inappropriate scratching, clawing and spraying areas, and even harm’s way. What makes up a wireless cat fence? Wireless cat fences consist of just two components: a signal transmitter and a receiver collar. 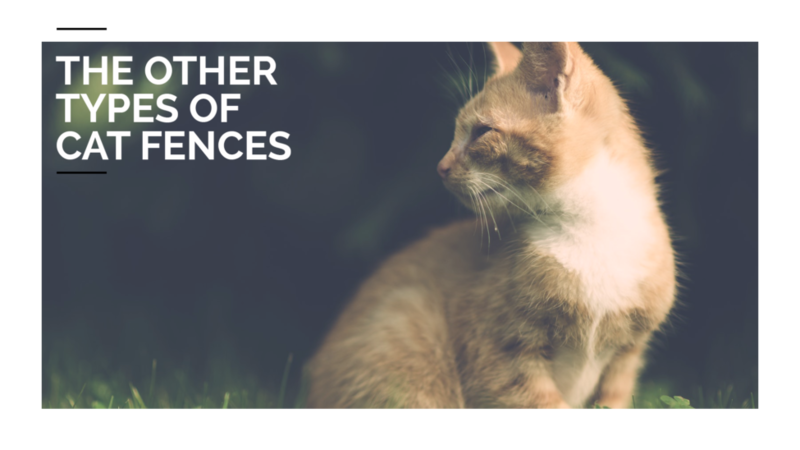 Initially, you may want to use boundary flags when you begin perimeter training, but they are removed once your cat recognizes and respects her new limits. The collars typically weigh one ounce or less. You want them to fit comfortably, yet snug, keeping one finger width between the collar and your pet. This will help enhance the effectiveness of the system. If you are using the wireless fence as an outdoor containment system, feel free to remove the collar while your cat is inside, to prevent any potential collar irritation. The signal transmitter comes in a variety of sizes, shapes, and types. Most are typically the size of a smoke alarm, although some indoor systems may be a small, coaster-sized disk. Outdoor wireless fences have transmitters that are weather- and lightning-proof and can be placed in a garage or basement. If you are concerned about aesthetics, rock-shaped transmitters, easily camouflaged in your landscaping, are also available. The type of transmitter varies, with some using sound, others static sensations, and others, both, to curtail your cat’s escape. More info on how they work is below. How does a wireless cat fence work? You will place the transmitter where you want the boundary to be, either indoors or outside. You can designate a small area (maybe just around your front door) or your entire back or front yard. The transmitter will emit a radio signal in all directions. When your cat gets too close to the boundary, a small alarm will sound on the receiver collar, alerting her to back away. Unlike dog fences, which sometimes have trouble deterring certain hunting breeds, cat fences require very low-level preventative measures to corral your feline friend. For sonic transmitters, an alarm sounds when your cat enters the designated no-go zone. It isn’t loud, just enough to alert and remind the cat to remain within the barriers of the wireless fence. The sensation transmitted in the other systems is a very subtle, almost imperceptible tickle to remind Fluffy to stay inside her perimeter. It takes very little to deter the cats, and they quickly learn to adapt to this new, safer environment. If we are judging effectiveness based on the volume of sales and number of new products hitting the market, then yes, wireless fences could be considered VERY effective at keeping your cat safe. 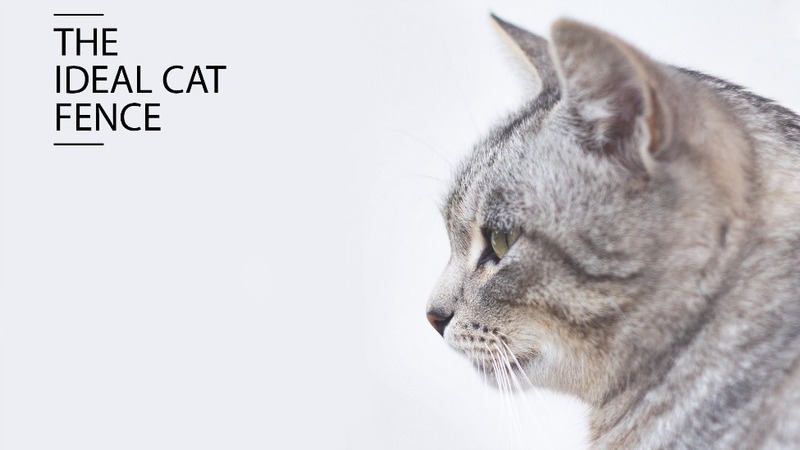 The number of programmable options for each system is reassurance that you will find the safest and best deterrent to keep your cat out of harm’s way. Underground, or “in-ground” cat fences, are similar to the wireless system in many ways but have a few small differences. Why an underground cat fence? Unlike wireless fences, the underground fence can cover a much larger area and can be customized to your particular needs. Need an even larger area of coverage? Just purchase more wire to extend the perimeter. Underground cat fences are called this because their system contains one more component than the wireless cat fence system: a thin, flexible wire that you bury in the ground in your designated boundary. Where can I place an underground cat fence? Don’t get hung up on the “underground” description; if using inside, the boundary wire can be easily bundled with existing household wires, and remain discreet. If using outside, the possibilities are endless. You can designate a boundary to keep your precious cat out of a pool area, landscaping, a children’s area, or a garden. How does an underground cat fence work? Underground cat fences work in exactly the same way as their wireless counterparts: sending a sound or sensation to the receiver collar when the designated barrier is breached. Only instead of a radio signal, you have a physical wire present. Are underground cat fences effective? Sold alongside the wireless cat fence options, these systems are neck-and-neck sales-wise with their wireless cousins. Newer, sleeker, more programmable versions are hitting the market every few months. 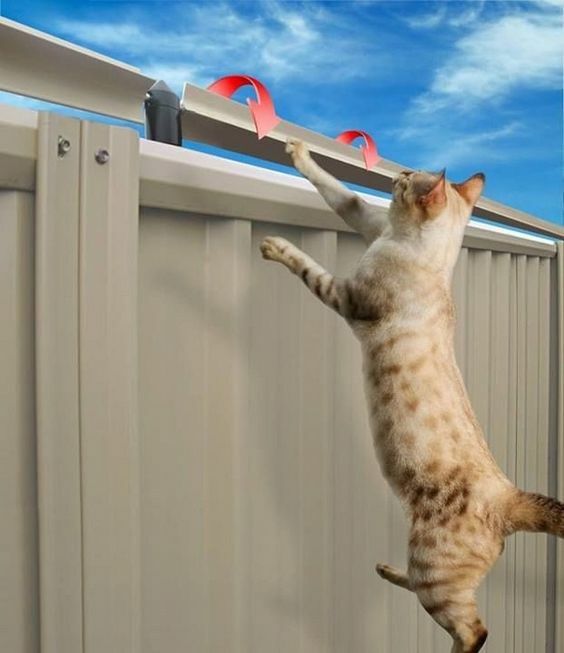 Inexpensive and effective, cat fence spikes can be the perfect solution when you have few options. Where can I place cat fence spikes? Cat fence spike strips can be placed anywhere you desire to keep your pet contained. Typically, they are placed on top of fences and gates. What are cat fence spikes? The spikes are usually made of rubber, as cat paws are very sensitive and need little discomfort to deter them. You buy them by the strip and can customize their length and width. How do cat fence spikes work? 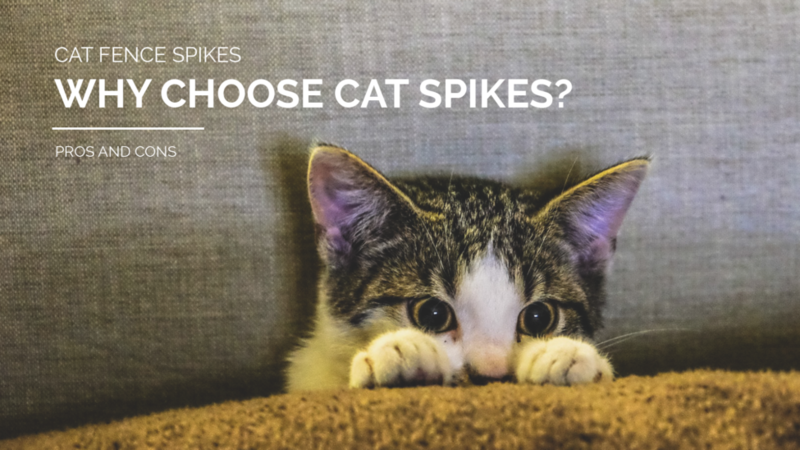 Spikes provide just enough discomfort to discourage your cat from climbing over a fence. Cats learn quickly which areas to avoid. Are cat fence spikes effective? The reviews are mixed. Cat owners claim that the spikes sometimes are not enough of a deterrent to their pet. Other owners balk at the appearance of the spikes on their fences. No matter which system you choose, you are making the right choice when you make your cat’s home a safe and happy one! Best of luck and happy shopping!